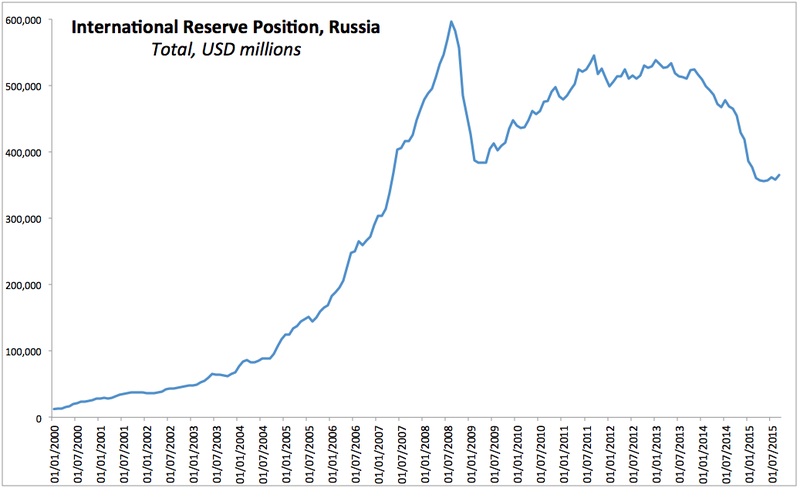 As I noted earlier this month, Russia has officially entered the recession. The key drivers for 3.4% contraction in 1H 2015 were the same as the key pressures on growth back in 2H 2014: oil prices, investment collapse on foot of high interest rates, inflationary environment that restricts CBR's room for cutting rates, and sanctions (or rather geopolitical risks and pressures, linked in part to sanctions). That said, in June and early July there were some hopes for economy starting to stabilise, although fixed investment was down 7.1% y/y in June, marking 18th consecutive month of y/y declines. These are now once again under pressure and the cause is... oil price. Here is how closely paired has Russian Ruble been to oil prices in trend terms since July 2014, although correlation was weaker in preceding period. 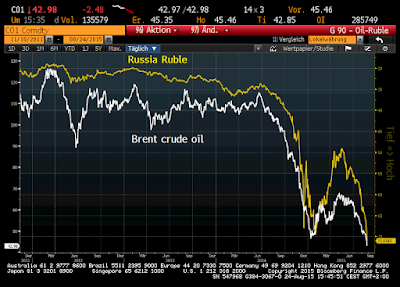 Overall, as the chat shows, there are two very distinct periods of Ruble valuations catch up with oil prices: June 2014-February 2015 and mid-July 2015 through present. Russia's Central Bank is switching between little concern for Ruble to interventions and back to staying out of the markets appears to be more than a simply random walk. 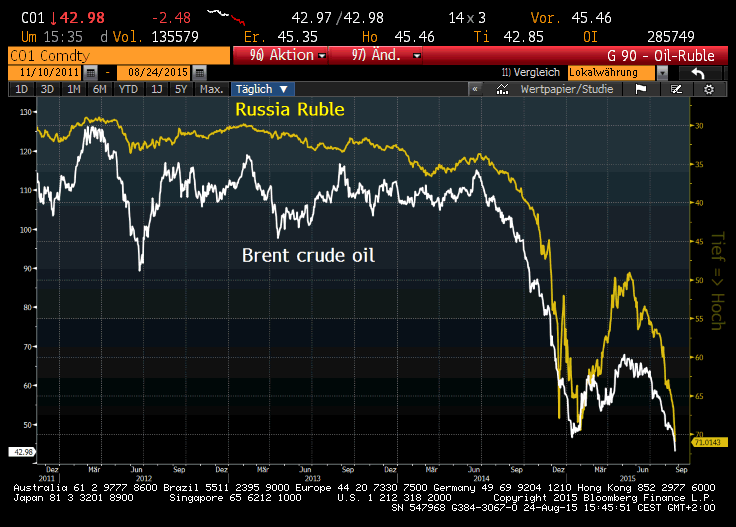 Instead, it is a game consistent with rebalancing Ruble valuations to fit budgetary dynamics. The reason for this is that (as shown in the chart above) Ruble strengthening above oil-linked fundamentals earlier this year was an actual threat to budgetary dynamics, and over the last couple of weeks, correcting valuations of Ruble re-established closer connection to oil prices. Hence, in July, CBR managed to deliver a shallower cut to interest rates (-50bps) compared to June (-100bps). With CBR continuing to stick to its June 2016 forecast for inflation to fall to 'under 7%' by then and hit 4% in 2017 compared to July 2015 CPI at 15.6%, Russia went on to issue its first CPI-linked bonds / linkers amounting to RUB75 billion (OFZ-IN, 8 year notes) at 91% of nominal, on cover of RUB200 billion (more than 25% of demand coming from foreign investors). Real yield at issuance was 3.84% - relatively high-ish, implying underpricing of the bond in a market with relatively hefty demand and forward expectations for significant easing in inflation. Something is slightly amiss here. In line with up-down interventions, the CBR continued to trend flat on foreign exchange reserves. 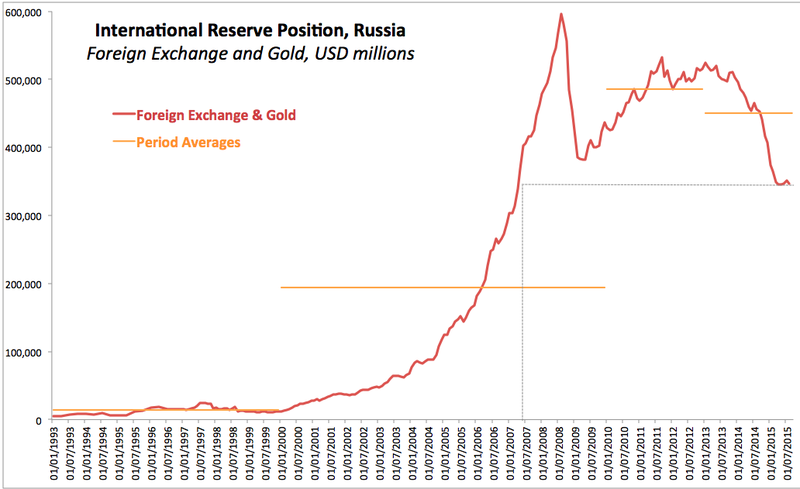 End of June, total Russian FX reserves stood at USD361.575 billion, and by end of July these fell to USD357.626 billion. 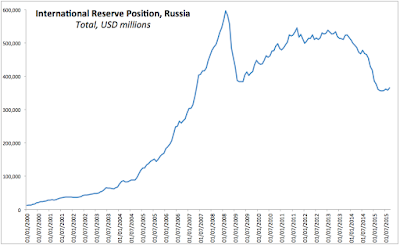 As of last week, the reserves were back up at USD364.6 billion. Weekly data from CBR does not allow for compositional analysis of reserves, but looking at the monthly data the pattern repeats. 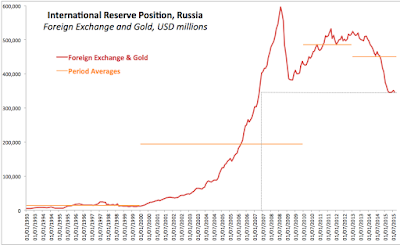 Actual liquid FX reserves and gold stood at USD347.1 billion at the end of July against USD350.957 billion at the end of June. This is barely up on end-April period low of USD345.373 billion, although well within the FX- and gold-valuations range of change. Meanwhile, data through July 2015 shows net purchases of dollars of USD3.76 billion against USD3.831 billion in June and USD2.531 billion in May by CBR. Overall, from January 2015 through July 2015, CBR bought (net) USD7.8 billion and there were no net purchases/sales of euro. 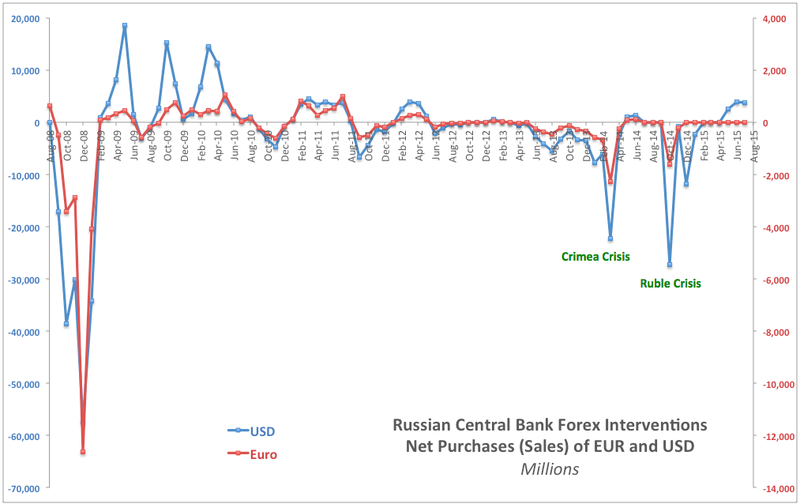 All of the above suggests that CBR will likely resume rate cuts if Ruble firms up from its recent valuations. 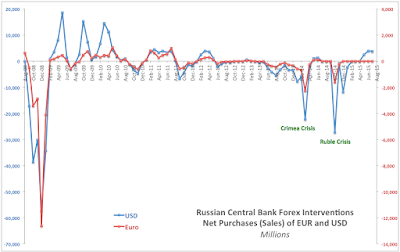 Two weeks ago, RUB/USD was at 64.947 (72.197 to Euro), peaking at 70.887 four days ago (82.373 to the Euro) and currently at 66.8875 (74.984 to Euro), not exactly warranting a move by the CBR yet, but back in the relative comfort zone for the Bank to sit on its hands once again.